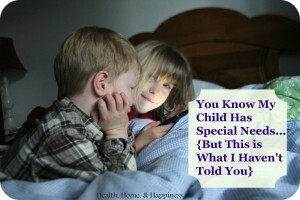 This is a followup article from You Know We Have a Special Needs Child, here are 10 things we might not have told you. Families have asked for tips on socializing with families who have a child (or children) with special needs. Each family with children with special needs is different, these are tailored more towards families with children with autism spectrum type issues, sensory processing issues, and food allergies since that’s what I have experience with. 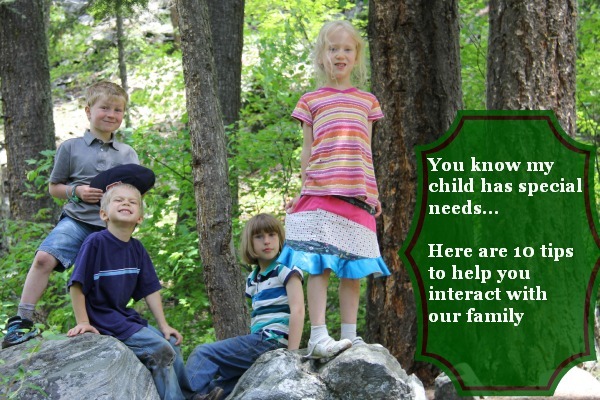 If you have other tips for interacting with other families, please comment below, I’d love to hear from you! “I think it’s good to treat children with disabilities just like any other child their age” may be politically correct, but it’s totally not functional for our family. My child is 7, but she doesn’t act like she’s 7. Her skills are all over, she knows her way around the kitchen better than many adults, can keep up with many 7 year olds on her bike, and can hike like nobody’s business. But if you ask her ‘age appropriate’ questions, you’ll often be met with completely unrelated commentary about her cute dog named Toad. She likes games and books geared toward the toddler and preschool crowd, so for those kinds of things go ahead and meet her where she’s at. Gifts are tricky, I generally just let people get her what they want to get her. She didn’t really care about possessions until recently (at 7), and even now her wants don’t coordinate up with gift-giving opportunities well. This week she wants a headband, but last week it was green sandals, and the week before it was a different carseat. I wouldn’t stress about gifts much, and focus more on time and attention. This goes for the rest of the family. Some days everything’s going well and I feel like Supermom. Some days I’m just tired and may be sitting down in the middle of chaos at 4 in the afternoon drinking coffee. Or spiked lemonade. This really isn’t much different than any other family with children, but sometimes others think that because we have children with special needs we keep to some higher standard, but nope, we don’t. ‘Sensory issues’ affect many children, typically developing or not, but often more severely affect children with special needs. Sensory integration disorder is where certain sensory sensations (sound, light, taste, smell, touch) are interpreted differently by the brain. Where you and I might find sandpaper unpleasant to have repeatedly touching our skin, some kids get a similar feeling by just wearing certain kinds of socks. Loud noises might be unbearable for some, same with bright lights, or just too much visual stimulation in general. On the other hand, some people crave these sensations, because their brain isn’t registering the sensations how typical people register them, so they want *more* bright lights, more sounds, different textures to touch repeatedly. For many children with special needs it’s a mix of both. For example, my daughter gets over dosed on visual stimulation quickly, but enjoys rough play (touch) and loud sounds. So I can take her to the shooting range or on a hike and she’s happy, but a trip to Target with all the different colors, bright signs, and fluorescent lights, is going to wear on her patience quickly. And when I say ‘wear her patience quickly,’ I mean we’re headed right to meltdown-ville. There are some children who honestly don’t notice special needs, and are happy to play with my child at her level and completely accept her for who she is that day. Most other children do need some sort of explanation about why my child has more meltdowns than yours, why she can’t eat certain foods, why she does certain things, why she doesn’t talk much, and so on. In the absence of an explanation and being taught how to respond, many children will become cruel through taunting or exclusion, or get exasperated because they don’t understand why the special needs child cannot keep up with age appropriate games. As a parent, it’s up to you to teach your child to be kind, your typically developing child *is* capable of learning, where my child with special needs most likely is trying the best she can to fit in and behave appropriately, and she is physically and/or mentally incapable. Don’t feel bad that your children aren’t naturally kind and compassionate, it’s something that needs to be taught. Even my typically developing child needs frequent explanations and reminders, and he’s obviously had plenty of exposure to special needs! 4. Watch the child’s parents or caregivers for cues on what will work with the child with special needs, and just believe them. For us, enclosed spaces were an issue, so I would try to keep my child out of play houses, forts, tents, and closets. In the car she needed to be next to an adult or have an empty seat next to her. If she always holds on to a certain side of the stroller or grocery cart, we might request that your child let her have that spot. She can’t ‘learn to share’ with certain things such as favorite toys (or random objects, for that matter), it’s just not something she can do right now. As silly or as minimal as it might seem to you, us parents usually know our kids’ triggers for meltdowns, and avoiding them will be a nicer experience for everyone. I assure you, we would prefer if our children had more flexibility, but they don’t, and we know what areas aren’t flexible. I might minimalize how I request certain accommodations too, it’s just because I’m tired of everything being so dramatic and black and white. So, ‘it would be easier if we met before lunch’ might be interpreted as ‘if we meet after lunch we can be there for 20 minutes tops, and it’s going to be exhausting for me’. Or ‘she doesn’t really do well with crowds’ essentially translates to ‘there is no way I’m bringing my kids to that totally awesome fair downtown this weekend’. 5. Engage in favorite behaviors with our special needs child. So, what do we do when we’re together? Most children with special needs will love being involved in their favorite activity with other people. If the child loves to fly kites, fly kites as a group. If she loves to draw, do that. If she wants to play Jake and the Neverland Pirates (yo ho let’s go!) engage in pirate type activities. Even if you’re doing the same thing over and over, or she is sitting more on the sidelines and watching, she loves that you’re doing what is familiar and loved by her. Don’t feel like the entire time you play has to be focused on her, though. These are just ideas to engage in a way that meets her where she’s at. Meltdowns happen. Even if it was triggered by something you did, don’t take it personally. Depending on the ages and abilities of the child, they aren’t all preventable, they are just part of parenting this particular child. 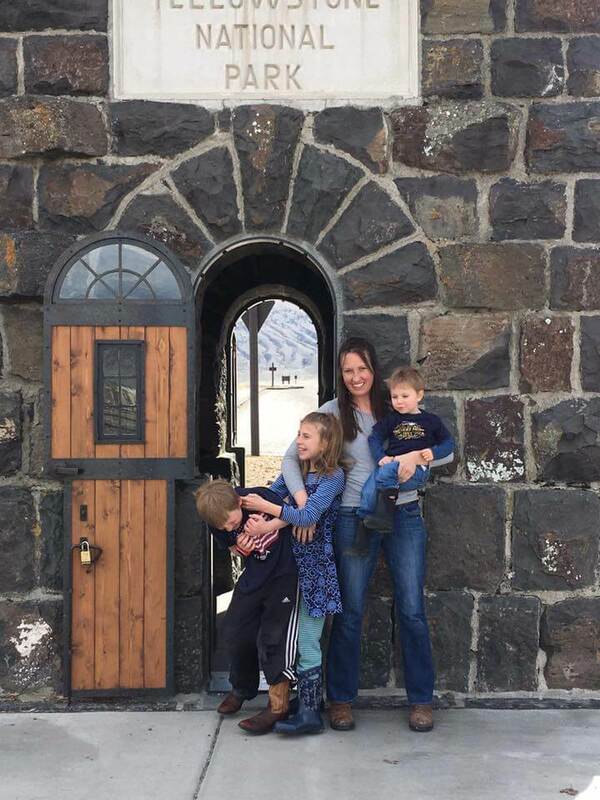 Even though it looks a little dramatic to see a mom have to pick up and carry her 6-year-old, it’s pretty common in our house. Watch the parents’ reactions, they most likely are going to look like they’ve done this thing a million times before and will deal with it as quickly and calmly as they can. If you want to help, feel free to gather anything up that may have gotten thrown, or assist with non-melting-down children. 7. Carefully consider before offering suggestions or ‘constructive criticism’. I’m flattered that you were thinking about us when you saw a segment on TV/had a friend or family member who got good results/read a book about a new supplement/treatment/essential oil/diet that might help my child. Really, I am, it’s sweet. But it can be awkward to explain why I’m not up for the specific treatment right now; I might not be able to afford it, I might actually be pretty biased against that treatment and I don’t want to jump down your throat, or I might just not be able to fit it into my already hectic lifestyle right now. 8. Ask what our good times and locations are. Our family is a morning family, and we’re big fans of nature. We love parks that have a stream through them, hikes, trips to the beach, and other outdoor activities. We don’t do so well in crowds or kid-themed places like amusement parks. We also might have to plan a more structured visit than you’re used to, or keep the visit shorter. When my daughter was young, I had to keep everything very very low-key after 3:30 pm or she would be overstimulated (see #2) and wouldn’t be able to fall asleep til midnight. Even just picking up milk from the milk drop at 5 would cause the evening to be chaotic. Thankfully she’s grown out of this, but we still prefer mornings. I know you can’t schedule everything around my kid, but I might have to opt out of evening or afternoon activities because of her needs. 9. 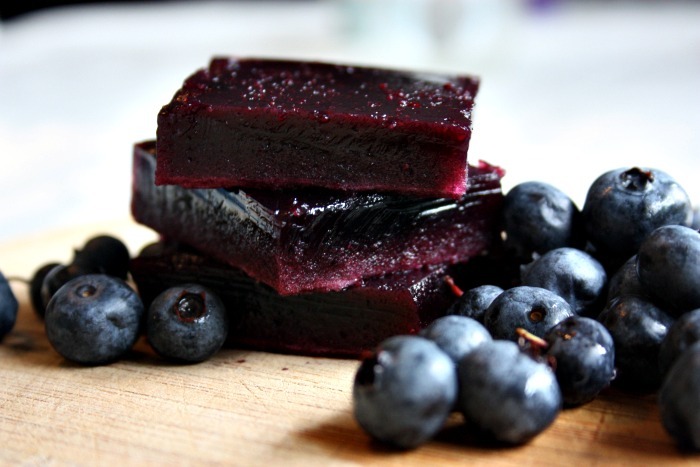 If the kids are on a special diet, offer to do something without food. Special diets are another hurdle for socializing with other families. With older kids who are able to understand what we eat and what we don’t, it becomes less of an issue (we still don’t snack, so my kids know to ask before they eat food offered to them by others), but with toddlers and preschoolers, or children who have recently been put on a special diet, it’s really hard for them to see kids eating what they cannot eat. If you can plan to just not meet to play around mealtimes, that can make our lives so much easier! Leaving the sippie cup and goldfish in the car or at home alleviates lots of stress for parents. In general, if a child is really high functioning but has some quirks, I don’t assume either way and I don’t ask, I just smile and ask the child questions about what they’re doing, or comment on their shirt or backpack or something else that they seem to enjoy. If a child has a pretty noticeable disability, feel free to ask me questions about it! I try to jump in when people are asking my daughter questions that she can’t answer. I love that they talk to her first (most people do this), but if I know that they want to know ‘what’s going on’ I quickly fill them in. I also give this ‘This is Hannah, she’s 7, and loves it here! She has special needs and can get overwhelmed sometimes and occasionally runs off so she needs a little more supervision than most. Please don’t hesitate to come get me if you need anything’ pitch to people that I don’t recognize in children’s church just so they’re aware of what’s going on and have some background so they know how to approach her. Before she was walking I made sure to warn people about this too (she walked after 2 years), and did the same when she was nonverbal so that people knew she wasn’t just ignoring them. If a parent of a child who’s having a meltdown is a little less gracious with your attempts to help than you think they should be, don’t take it personally. This may be the 5th meltdown this hour, and the mom still has a few more stops that have to be made, and she might be at the end of her rope. When I see a child melting down in a store or in public, I will smile and start helping if there’s anything that I can help with that isn’t directly related to the child (pushing a shopping cart to a car, helping unload groceries, helping pick up any objects that are flying). If it’s something obvious that would be helpful, I don’t even ask, I just start doing it. If the parent is offended or says they don’t need help, I move along. If there’s nothing that I can help with, I’ll smile at the mom and let her know she’s a great mom. I explain to my kids, often loud enough that any other onlookers can hear, ‘it’s ok, it looks like she’s just a little overwhelmed, it happens sometimes to everyone’. Have questions? More comments? Please leave a comment below :) We’d love to hear from more of you! Check out the first post that prompted this one here. I really found this very helpful. I don’t have have a close friend with a special needs child, but now I can know what to do and not to do if one comes along. :) Thank you so much for your clarity and honesty! Well written and very thoughtful. As a mom of a special needs child who knows all about tantrums in the wrong places and insensitive comments (and not always well meaning) from family/friends/strangers, I think that you are spot on. Also if you manage to handle your daughter’s special needs together with people’s ignorant attitudes so gracefully, you really ARE Supermom! :-) When we think about it , it’s all common sense advice… but unfortunately very few people think that way. Wish I could make everyone around us read this. I think my biggest problem is people seeing the carefully orchestrated event like a trip to the store or visit to the park that looks calm and ‘normal’, and they don’t realize how many ways I’m compensating to get it to go well – time of day, not leaving if she’s already had a bunch of stressors, making sure things are the same that need to be, and often bribes. It looks easy when it all works, but it’s a lot of work to get it to work! GREAT article, with lots of practical advice. As the mother of three young ladies who all happen to have Down Syndrome, I could have used this article YEARS ago! I just posted it to every group I belong to on facebook that deals with special needs. You did it again. Thanks for being able to put yourself in the place of others and ask the questions they would ask. Thank you ❤️ Solidarity sister!